This is part 6 of Practice Exam for NCLEX-PN. Feel free to browse our NCLEX practice exam parts 1 to 5 and make sure to subscribe in our e-mail to get updates like this. 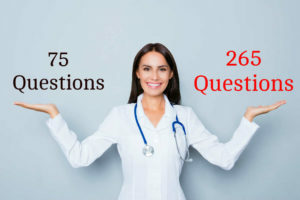 If you want to practice more questions, we strongly suggest to get a copy of NCLEX-PN Practice Questions and NCLEX-PN Exam Cram from informit.com. 3. A client is hospitalized with hepatitis A. Which of the client’s regular medications is contraindicated due to the current illness? 4. The nurse has been teaching the role of diet in regulating blood pressure to a client with hypertension. Which meal selection indicates that the client understands his new diet? 5. An 18-month-old is being discharged following hypospadias repair. Which instruction should be included in the nurse’s discharge teaching? a. The child should not play on his rocking horse. b. Applying warm compresses to decrease pain. c. Diapering should be avoided for 1–2 weeks. d. The child will need a special diet to promote healing. 7. The nurse has taken the blood pressure of a client hospitalized with methicillin-resistant staphylococcus aureus. Which action by the nurse indicates an understanding regarding the care of clients with MRSA? a. The nurse leaves the stethoscope in the client’s room for future use. b. The nurse cleans the stethoscope with alcohol and returns it to the exam room. c. The nurse uses the stethoscope to assess the blood pressure of other assigned clients. d. The nurse cleans the stethoscope with water, dries it, and returns it to the nurse’s station. a. The medication will be needed only during times of rapid growth. b. The medication will be needed throughout the child’s lifetime. c. The medication schedule can be arranged to allow for drug holidays. d. The medication is given one time daily every other day. 10. The nurse is caring for a client admitted with suspected myasthenia gravis. Which finding is usually associated with a diagnosis of myasthenia gravis? 13. A client with diverticulitis is admitted with nausea, vomiting, and dehydration. Which finding suggests a complication of diverticulitis? 15. A client with AIDS complains of a weight loss of 20 pounds in the past month. Which diet is suggested for the client with AIDS? 16. The nurse is caring for a 4-year-old with cerebral palsy. Which nursing intervention will help ready the child for rehabilitative services? 18. Which of the following pediatric clients is at greatest risk for latex allergy? 22. A 3-year-old is immobilized in a hip spica cast. Which discharge instruction should be given to the parents? 23. The nurse is caring for a client following the reimplantation of the thumb and index finger. Which finding should be reported to the physician immediately?